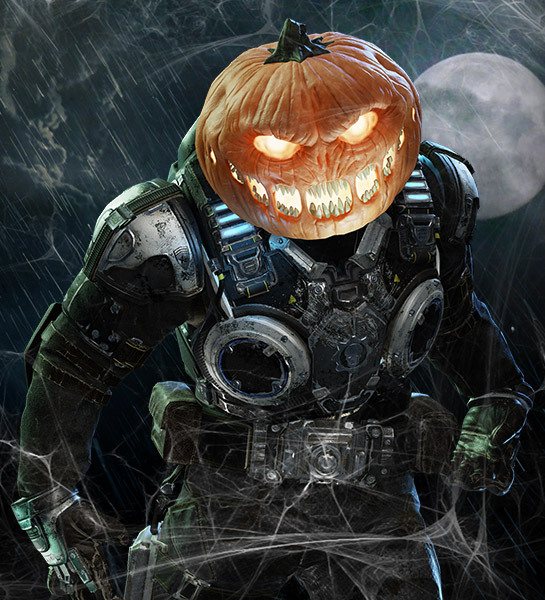 Halloween has arrived in Gears of War 4! This year, we're marking the spookiest holiday of all with new characters to collect, new Flaming Weapon Skins to earn, a new Horde variant, more Double XP *breath* AND some small October 31st surprises. Here's What's Up in Gears of War 4 for Halloween! Get in the spirit of the holiday with new Day of the Dead characters to collect! 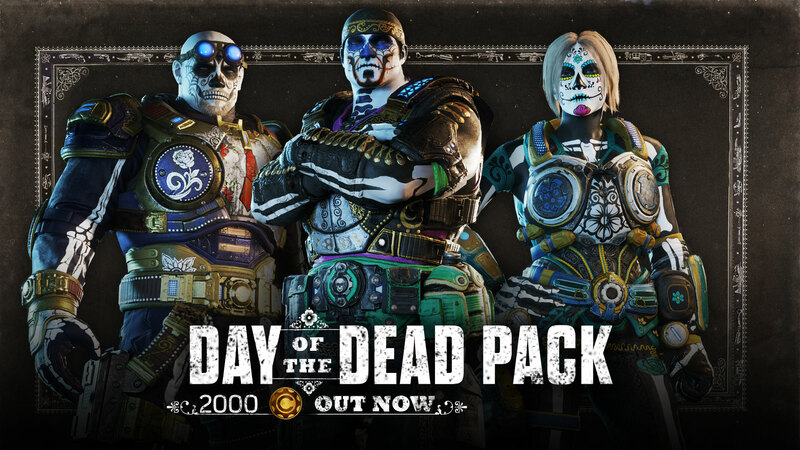 This new Gear Pack features Marcus, Anya and Baird Day of the Dead variants alongside the Day of the Dead 2017 weapon skin set! Find this Gear Pack in-game now for 2000 Credits until November 3rd! Pumpkin Ball is back! If you didn't catch it last year, Pumpkin Ball is a fast and furious version of Dodgeball with 1 second respawns and Pumpkin Heads! Expect some shocks as respawning enemies appear out of thin air. Enjoy Pumpkin Ball with Double XP until November 6th! Earn the Flaming Hammerburst and Retro Lancer weapon skins by taking on challenges in the Pumpkin Ball playlist! These weapon skins can only be earned through registering for this competition, and completing the relevant challenge below. You can’t find these anywhere else! These stats are tracked in our backend and not visible to players. We recommend manually tracking as you play if you want to ensure you earn both Weapon Skins. To qualify, you must be connected to Xbox Live and complete these objectives in the Pumpkin Ball playlist by no later than November 6th at 10am PDT. Rewards will be granted to qualifying participants by the end of November. The monsters will rise for Halloween! 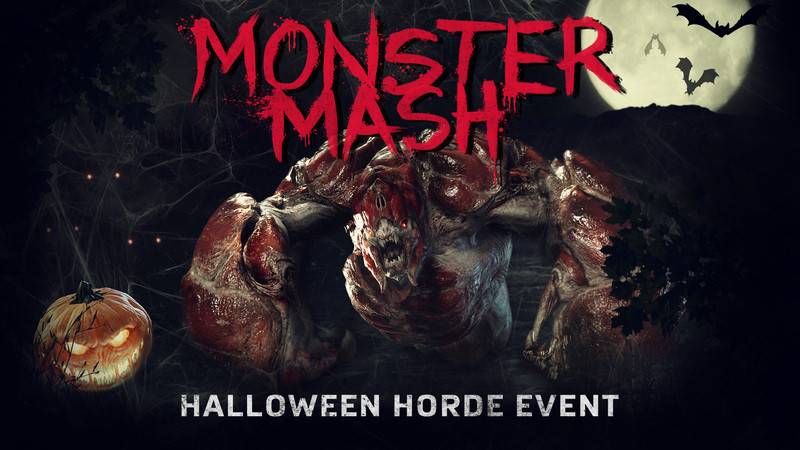 By popular demand, Monster Mash brings Swarm only Horde with the insanity of Horde Frenzy (Normal and Insane difficulties). That means 25 waves of intense action with a boss every 5 waves, Swarm enemies only (including uncommon Horde enemies like the Swarm Sniper) and random wave combinations. The playlist features darker maps to get in the spirit of Halloween. Play it now with Double XP until November 6th!